Hard disk drive is an integral part of every computer. It stores all your information. One of the most prevalent defects of hard drives is bad sectors on the disk surface. Bad sectors are a part of the disk surface which contains not readable, but frequently necessary information. As a result of bad sectors you may have difficulties to read and copy data from your disk, your operating system becomes unstable and finally your computer may unable to boot altogether. When a hard drive is damaged with bad sectors, the disk not only becomes unfit for use, but also you risk losing information stored on it. The HDD Regenerator can repair damaged hard disks without affecting or changing existing data. As a result, previously unreadable and inaccessible information is restored. -Ability to detect physical bad sectors on a hard disk drive surface. -The product ignores file system, scans disk at physical level. It can be used with FAT, NTFS or any other file system, and also with unformatted or unpartitioned disks. 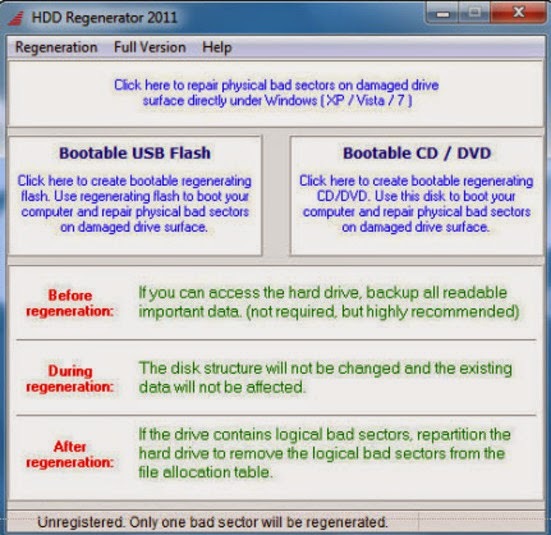 -Bootable regenerating CD / DVD allows starting regenerating process under DOS automatically. Real-time hard drive status monitor. 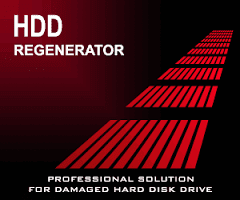 HDD Regenerator realtime monitor is more poweful and precise than ever in timely prediction of hard drive problems. - Register Application with given serial/name.